Treehut has products to make your skin soft and exfoliated, moisturized to the fullest. From body scrubs, foot scrubs, extra moisturizing lotions, hand creams and more. Their specialties are hand & foot care, Olive and Shea, Travel and trial sizes. There are things to help with moisturizing and even a total of eight fragrances (as of now). No other natural beauty skin care items that can also reduce aging and repair skin while moisturizing and exfoiliating your skin for that wonderful glow. My favorite one is the Coconut Lime Extra Moisturizing Body Wash. I’m a huge fan of the scent of coconuts. Every scent that they have is tropical scents and they are wonderful combinations. With the body scrub, you remove all dead skin cells and even mositurize your skin. This helps to maintain healthy glowing skin. I’d also love to try out the Tropical Mango. I love these two scents, plus my skin could seriously use this right now. The heat of the summer is the most important time to exfoiliate the dead skin cells. Most women and men wash their hair using shampoo and sometimes conditioner, then use a body wash. Most of us forget to exfoliate the dead skin cells. If you don’t remove the dead skin cells, you will know it if you’ll take and rub your skin with a towel. Dead skin will still come off of your skin onto a towel or even your own hand. This keeps your skin from maintaining moisture and deminishes the glow. Every Wal-Mart has Treehut products. Just look in your skin care isle (nationwide) or go online to Walmart.com and type in treehut natural skin care. Some Targets are also carrying the Treehut Natural Skin Care line. 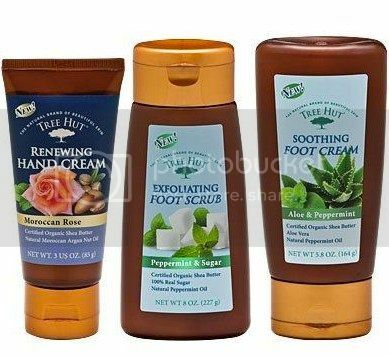 You may also locate their Tree Hut hand cream, Tree Hut foot cream and Tree Hut foot scrub here at these links.